Fish Biriyani is yet another specialty of Kerala Cuisine. 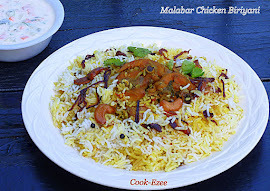 It is more popular in malabar region I believe where fish is an integral part of daily diet. Being from Thalassery where fresh fish is abundant we used to have fish as a main or side dish every single day. Our lunch menu used to be Boiled Rice with a simple Vegetable Curry made with vegetables grown locally, a healthy Veg Stir Fry(Thoran) and a mandatory Fish Curry or Fish Mulakittathu or Fish Fry. Though the fish we get were simple fishes like Sardines(Mathi), Mackerel(Ayala), Stingray(Thirandi), Shark(Shraavu) etc, we kids were happy with one or two pieces of fish in the corner of our plate and the sniff of it helps us consume the rice without any tantrums unlike the cute little picky eaters now a days. I prefer Fish Biriyani over any Chicken/Lamb Biriyani, my husband is a fish lover too especially this Fish biriyani. I remember him eating all the fish pieces and asking us for fish again and again when he visited us for the first time couple of days before marriage. I could see the embarrassment on my MIL's face and me and my MIL laughs everytime we discuss about it. My hubby is a person with zero formalities and I could see him 'trading' chicken for fish with my cousins when we came to my home first time(for Virunnu/Salkkaaram) after marriage ;) Those were some sweet memories of life. 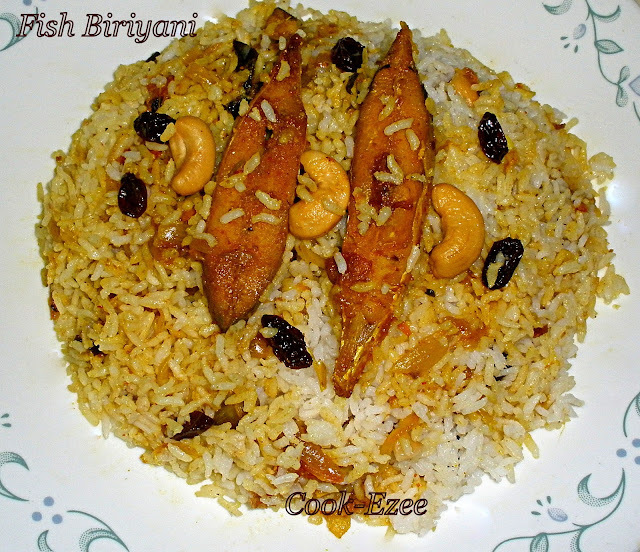 So I love to make this fish biriyani for him and kids and my Son absolutely loves it too. As I mentioned before in Malabar, Kaima Rice also known as Jeerakasaala Rice/Jeera Rice is used for making Biriyani which tastes way better than the Basmathi Rice. It has a very good fragrance in its own and when cooked with spices and ghee the biriyani tastes fabulous. You guys might laugh at me when I say I carried some Kaima Rice/Jeera Rice last time when I flew back from India :-) My FIL and my hubby were literally pulling my legs when I bought them from local store near our home. 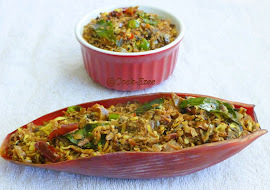 I made this fish biriyani with Jeera Rice and my hubby who was making fun of me before started appreciating me whenever I made Biriyani with this rice. You can definitely use Basmathi Rice which is also aromatic and tasty if you don't find this Jeera Rice in your local grocery stores. 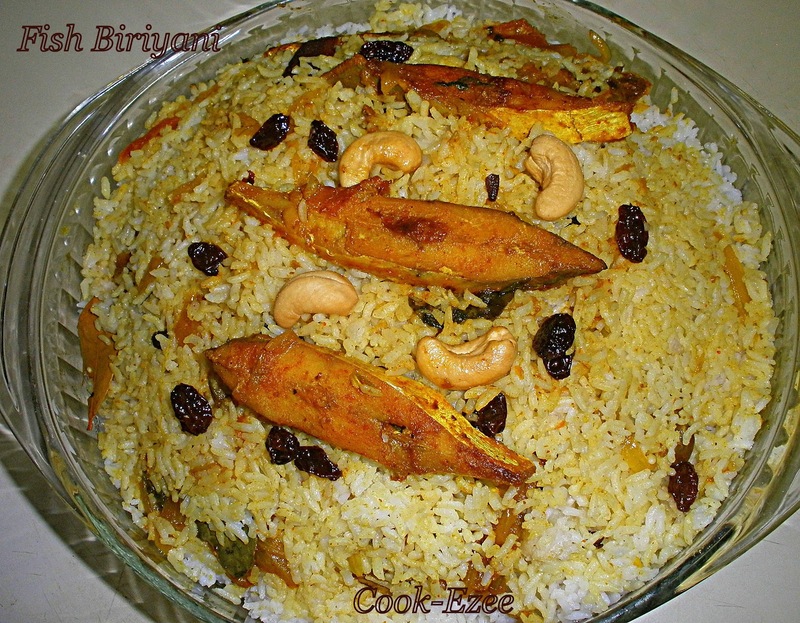 Try out this awesome Fish Biriyani and Enjoy!!!!! In a thick bottom vessel, add some ghee/oil in low-med flame. Add whole spices(ingredients from 2 to 6) saute for few minutes till they start to give a nice aroma, pour in the water and salt and get to boil. Add the rice, stir with a spoon till the bottom of the vessel, cover it with an air tight lid and let it cook till all the water evaporates. Switch off the stove and let it sit for few minutes say 10 minutes(don't put the spoon and try to sir the rice immediately, rice might stick when it is very hot and stick to the bottom). Move the rice to two to three platters and let them cool so that rice do not stick to each other. Marinate the fish with 1tsp turmeric powder, 1 tsp chilly powder, salt and vinegar and keep aside for an hour if possible. In a non-stick pan add a tsp of oil and slightly fry the fish both sides and keep aside. Add 2 tsp oil in a frying pan, add onions and saute for few minutes till they turn translucent, add green chilies, crushed ginger, few curry leaves, salt and saute till onion turns light brown. Add the chopped coriander and tomatoes and saute well till tomato are soft and oil starts leaving the edges. Add ½ tsp turmeric powder, 1 tsp of chilly powder and garam masala and saute to mix. Dilute the thick coconut milk by adding ½ cup of water, add to the masala and stir well till everything is incorporated. When the gravy start to boil add the fried fish pieces and mix with masala very gently taking care not to break the fish. Simmer the heat to low-medium, cover the pan and let it cook for few minutes in low heat(10 minutes). Take off the stove and let it cool for few minutes. Preheat the oven to 350 degree F in bake mode. Take a baking tray add a layer of rice, followed by a layer of fish masala, cahews, raisins. Repeat the process with rest of the rice, masala, cahews and raisins. Garnish on top with some fried cashews and raisins. Cover the top tightly with a silver foil. Bake it for around 25-30 minutes. Serve hot with raita, pappad and pickle.